It has certainly been a summer and early autumn for the record books all across California, but for very different reasons in different parts of the state. Record warmth has plagued nearly the entire state, while oppressive and truly uncharacteristic humidity rivaling that of South Florida (literally) has persisted across the southern half of the state. Precipitation wise, most of California has been much drier than average during September and October, with the remarkable exception of localized pockets of Southern California. Earlier this month, a slow-moving cut-off low combined with the pre-existing extremely moist atmosphere to produce intense and occasionally severe thunderstorms across the mountains and desert regions (and occasionally in the coastal plain) bringing highly variable conditions but also at least a few instances of devastating (and deadly) flash flooding. This isolated torrential rainfall, despite causing severe flash flooding, mudslides, and debris flows, has done little from a drought mitigation perspective. This is especially true since more northern parts of the state have remained almost entirely dry in recent weeks. In fact, parts of the Bay Area have only seen around a tenth of an inch of rain during a nearly 5 month stretch between June and late October. While California is famous for its unusually well-defined dry season, that’s remarkable even by Golden State standards. This strange combination of seemingly unending heat, humidity, and large contrasts between extreme dryness occasional flash flooding is largely the result of record warm Pacific Ocean temperatures, which are still well into the 70s across the Southern California Bight and have even approached 80 degrees at times this calendar year. Along with the fundamentally un-California-like weather and ocean conditions, various species normally accustomed to more southerly habitats have started to appear in California. This summer has witnessed the arrival of millions of red crabs and (more recently) venomous sea snakes on SoCal beaches. Los Angeles County public health officials warned this week that aggressive, non-native mosquitoes capable of carrying tropical diseases were making inroads in California’s urban areas. Meanwhile, broader drought impacts continue to worsen, and newly available data suggests that upward of 100 million trees–potentially more than 20% of the total number in the entire state of California–are already dead or dying as a result of drought stress and bark beetle attacks. This widespread forest mortality doesn’t include urban areas, where many thousands of more trees are suffering a similar fate due to lack of precipitation, record high temperatures, and landscape irrigation restrictions. While parts of Northern California have experienced light precipitation in recent weeks, conditions have remained far warmer and drier than usual. Fortunately, the GFS and ECMWF models are presently in agreement that a cold low will likely sink southward this coming weekend, bringing drastically colder weather to much of California, fairly widespread lower elevation showers, and probably some accumulating snowfall across much of the Sierra Nevada. 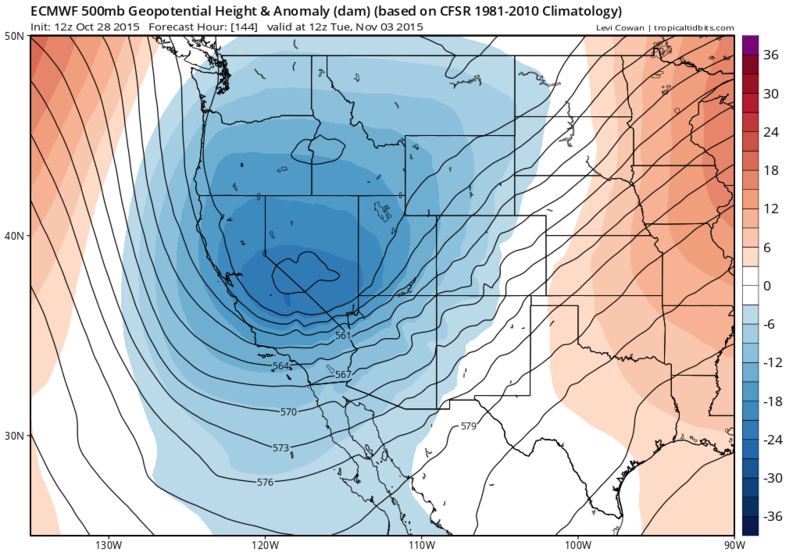 While this will not be a remarkable storm by any standards, it will finally break the incredible warm spell that has remain so deeply entrenched across California for many weeks. Precipitation will remain rather modest, though, and won’t do much to bolster early-season totals. It’s possible that additional cooler, potentially showery systems could follow this initial one during early November, but the general consensus at the moment is that no major precipitation events are likely over the next 2 weeks. The record warmth and recent anomalous autumn dryness have been unnerving for many Californians who are, very understandably, anxious about the increasingly severe impacts of California’s worst drought on record. There has been much consternation over what a dry start to the rainy season might portend for the coming winter–and many have looked to observed historical relationships for clues. For better or for worse, what happens in California during the early fall months really has very little to do with how the core rainy season months evolve on a statewide basis. From a big-picture perspective, this makes a lot of sense: California is uniquely dependent on seasonal shifts in the Pacific jet stream, and the climatological mean position of the storm track is quite different in October vs. January. The gradual southward shift in the storm track during the “cool season” is why much of the Pacific Northwest–including Seattle and Vancouver–often experience their wettest months in November or December, while San Francisco and points southward often see a January or February rainfall peak. This is especially true during a strong El Niño year (like the present one). Since the primary mechanism by which El Niño influences California precipitation is through strengthening (and shifting southward) the subtropical branch of the Pacific jet stream, it stands to reason that there would be relatively little influence until later in the winter (say, December or January) when the jet stream is actually in a position to bring regular storms to California. As it turns out, this is exactly what seasonal forecast models have been projecting for many months: there has been very high confidence in a dry October and November, mixed signals for December, and then high confidence again for a wet to very wet January-March (or April) period. So while it may be nerve-wracking to wait it out over the next month or so, all available evidence still points to a wet winter throughout the state. Snow conditions are a bit more equivocal, given the expectation of continued anomalous warmth, but all in all it does appear that California’s core rainy season months will be very active, indeed. And what about El Niño itself? Well, by most objective metrics, it couldn’t possibly look healthier. A recent series of very strong westerly wind bursts–which actually resulted in a total collapse of the easterly trade winds across a wide swath of the Pacific Ocean–has generated a new Kelvin wave, which is currently propagating toward South America. The “downwelling” warm phase associated with this new Kelvin wave all but assures that warm ocean conditions will either maintain themselves or strengthen even further over the next 1-2 months. Not only does this mean that peak SSTs will probably occur during December or January (with peak California effects a month or two after that), but it also suggests that the present event still has some potential to become the strongest on record ( it’s already in the top three, and by some datasets already leading event the historic 1997-1998 event).